Situated on the grassy banks of the Zambezi River just 25km upstream from the Victoria Falls, Chundukwa offers the best of both worlds when visiting the Victoria Falls - only 30minutes drive away, however far enough from the busy hotels and buzzing helicopters to provide a real retreat for the mind and soul. 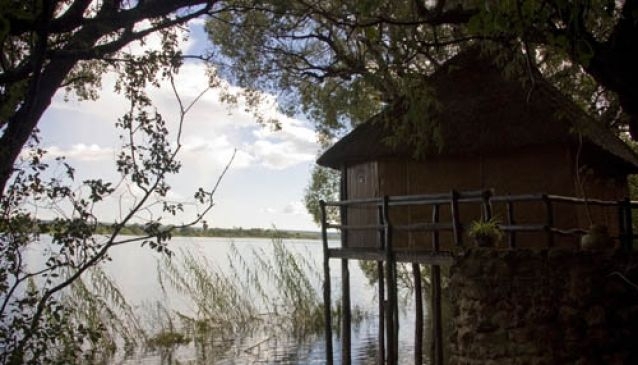 Here you will find a fabulous array of birdlife (over 450 species at the last count) and stunning views of the Zambezi River from our elevated open-fronted Chalets and Family cottage. An afternoon River Cruise is the perfect way to enjoy our spectacular Sunsets and a closer look at the River inhabitants. With Hippo grunting and campfire glowing, each day comes to an end with a uniquely African lullaby. With a maximum of 16 guests in camp, you are sure to find personalized service and helpful advice on planning your stay in this beautiful corner of Zambia.